July | 2010 | Planet Geek test site. > For the past several months, we’ve been working hard to combine the best features of Quicken Online and Mint.com into a single online personal finance solution–Mint.com. With the improved Mint.com, you can enjoy the features you love in Quicken Online, plus new benefits such as connecting to over 16,000 financial institutions, including Canadian banks–as well as tracking your investment and retirement accounts. There is also a new Goals feature that takes the tool you enjoyed in Quicken Online to the next level. > As a result of these changes, Quicken Online will no longer be available as of August 29, 2010. Creating a new Mint.com account is easy, but for reasons of security and accuracy, we cannot create one for you. Once you’re signed in, you can add your accounts and see your financial picture in just a few minutes. It was obvious from the beginning that Intuit was never going to make anything serious out of Quicken.com – they’re far more interested in Quickbooks. When they announced the aquisition of Mint.com, the writing was on the wall. I recently switched my online accounting over to Mint.com, and I have to admit it’s a helluva good system. Fast, very well designed interface, and good integration with my other finances. So, there ya have it folks. If you can’t code it, acquire it. Categories : Business yammerings, Geekitude, Life. Don't talk to me about life. I admit it. I’ve been a fan of the geoDefense games for quite a while (even during geoDefense’s Freak Out period). 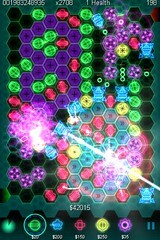 When Critical Thought Games released geoDefense Swarm, I jumped at it. The new game layout (free form, etc) took a little getting used to, but after a bit, I was hooked. For those not familiar with it, these are classic “tower defense” games. geoDefense used a fixed track for the ‘creeps’, while Swarm uses a free form layout. The game play is virtually identical between the versions (Swarm introduces ‘thumper’ towers, while de-emphasizing ‘vortex’ towers. Which is sad, cuz I do love me the vortexes). The games have a strong ‘retro’ color-vector look to them. That coupled with some smooth, stunning animation makes the play experience pretty exciting. As the towers get more powerful, and more dramatic action is happening, the visuals really ratchet up. The endgame for an endless level is constant nuke-explosions from the missile towers and plasma lasers firing every which way. Kaboom! Lately I’ve been rerunning Swarm levels and shooting for higher scores. This involves a huge amount of trial and error at the beginning, particularly on the ‘endless’ levels (which I adore). The trick is to get the score multiplier up as high as possible in the first 10 levels. My best is around 900x by level 10. That particularly run resulted in my best score ever in the Crazy 88 level (‘hard’ ‘endless’). The screenshot here shows the very end of that game, which took about 3 hours to play beginning to end. Naturally, toward the end, it was just a matter of watching the game run it’s course. Thanks @nsxdavid for making such an awesome game. Can we have some more endless levels please?